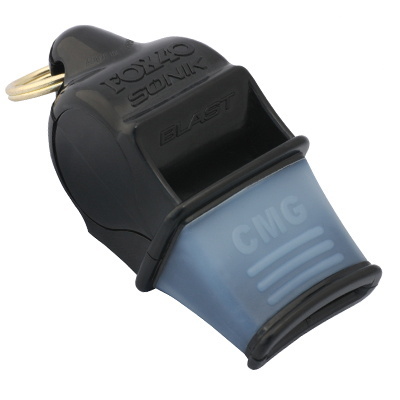 The premium Sonik Blast CMG Pealess Whistle provides additional comfort for holding the whistle in the mouth. Distinct louder pitched whistle provides a much powerful sound without a lot of effort. Easily heard over the crowds. Ideal for large outdoor arenas with large crowds and ambient noise. CMG is perfect to reliably hold the whistle in the mouth in wet conditions. Design: 2-chamber/4 resonators; pealess. Sound Power: exceeds 120 dB.